Good afternoon LOVEanese! I really want to apologize for my 7-week+ hiatus/leave of absence, but I was incredibly busy. With what you ask? Well... I can assure you, I've been hard at work, and a LOT has happened over the past month and a half! Now, remember how I've said I'm almost done with my thesis pretty much since January? Well... guess what? I FINALLY FINISHED MY THESIS!!! 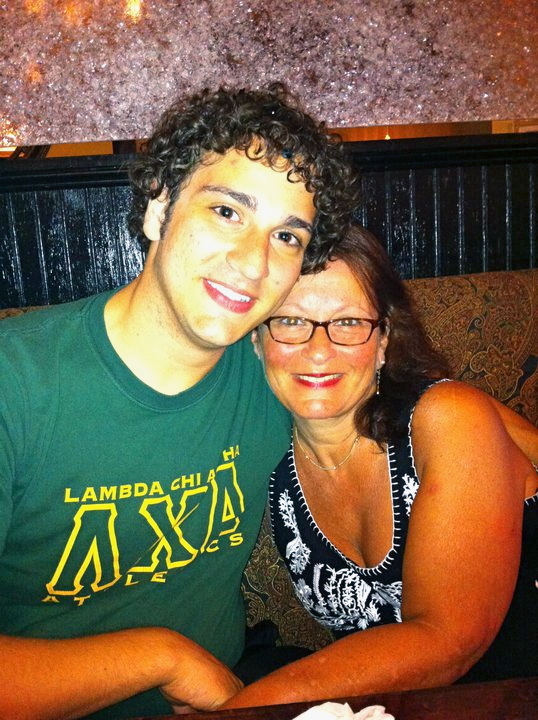 On May 18, 2012, I successfully defended my thesis (and passed of course! ), and then I submitted to the library on May 22. So, what does this mean now? Well, first, I'm officially Michael Oghia, MA, and I will be an AUB graduate come June 22. Second, I want to get back into the habit of blogging at least every other week, but preferably once a week. Third, and most excitedly, it means I get to share with you my results! -- My thesis is divided into 6 chapters: the introduction, which includes the purpose and significance, the theoretical framework, the literature review, the methodology, the results, and the discussion and conclusion. -- I posed 6 research questions. -- It is 163 pages in total, with 116 in just text alone not including references, appendixes, etc. It's even longer in the library version due to formatting. -- There are 44,201 words, 246,097 characters without spaces, 290,225 characters including spaces, 1,180 paragraphs, and 4,273 lines. -- Also, there were 4 sentences per paragraph, 16.3 words per sentence, and 5.3 characters per word. Concerning readability, it scored a 35.7 on the Flesch Reading Ease scale, and a 11.8 on the Flesch-Kincaid Grade Level scale. -- Of those 44,201 words, love is mentioned 847 times, romance is mentioned 431 times, and relationship is mentioned 367 times. Also related to the context, I want to begin by answering a question that almost everyone has asked me: what inspired this, and why exactly am I studying love? Quite simply, it was my mom! In 2008, I was with my mom on a vacation to see my family in Los Angeles, California, when she told me about a particular ex-boyfriend. She revealed to me how they were deeply in love, but my grandparents would not allow them to be together, ironically not because of the commonly-cited religious or sectarian reasons, but because he was not from the appropriate social and financial background (I would be happy to expand this story in its full form in another post if you would like to read it). I kept this personal anecdote in mind when I came to the American University of Beirut (AUB), and when I began to conceive this as a possible thesis topic, I wondered how relationship formation occurs now--over 40 years later--and I wanted explore how love is perceived by a younger generation. Per my abstract (and now into the technical stuff which I cover in the introduction (chapter 1)), I quickly discovered that romantic love is a topic largely absent from the social scientific inquiry in the Arab world. Although it has deep historical, literary, and artistic roots in the region, many scholars have traditionally reduced romantic relationship formation down to family-facilitated arrangements. However, increasing amounts of new, globalized discourses saturate the region, providing alternatives to the socially prescribed and sanctioned avenues of romantic love and relationships that may challenge the pre-existing romantic discourses, and influence the lived realities of individuals. Thus, the purpose of this study was to explore how a sample of unmarried Arab youth form and maintain romantic relationships, specifically focusing on how they define, experience, and identity romantic love, the value they ascribe to it, and what influences their perception of love. What I would like to do now is give an overview of the chapters leading up to the results (this is the presentation I gave at my defense, so if you couldn't make it, you aren't missing anything!). Let's start with chapter 2. Chapter 2 outlines the theoretical framework. I took an inductive approach in this study, grounding the conceptual framework in the results, which includes how romantic love is defined and conceptualized. To do this, I utilized Blumer’s symbolic interactionism, Bandura’s social learning theory, and social constructionism to not assume an a priori conceptualization of romantic love, and to illustrate the subjective nature of how meaning of romantic love is made. I also demonstrate that the way love is conceptualized interacts with Foucault’s notion of discourse to reflect power structures that govern social relationships, define what narratives are socially acceptable, and reinforce Bourdieu’s concept of habitus. Finally, I employ globalization theory (Wiki) and detraditionalization theory (Wiki) to discuss how certain phenomena linked to modernity provide outlets for alternate, external romantic narratives that directly challenge the existing discourse of romantic love and relationships. Chapter 3 reflects themes I talked about in this post about growing up in two cultures and its effect on relationship development. Basically, I review existing literature related to dating, relationship formation, and love in the Arab world, and also outline 5 key areas of adolescent and young adult romantic relationship formation: culture, family, peer networks, experiences, and the mass media. In the family subsection, I detail how the Arab family is paramount to accessing and securing what Bourdieu calls social capital. Contextualizing this, I argue that, due to the weak Lebanese state institution, individuals rely on family and kinship networks for resource acquisition and security, but in turn, the family employs powerful mechanisms of control such as patriarchy and the honor/shame system that regulate and govern behavior. This occurs due to the potentially dire consequences of disrupting these networks on the entire family, which is exactly what love can do, particularly if an individual’s actions--such as being in love with someone that does not merit familial or social approval--are perceived to endanger the family’s ability to access social capital, or do not reinforce solidarity that is necessary for social, economic, and political survival. Moreover, I review how three pertinent changes to the Lebanese family including living in a post-civil war society, the decline of the extended family, and the generational gap are challenging the established practices and perceptions of romantic relationship formation. 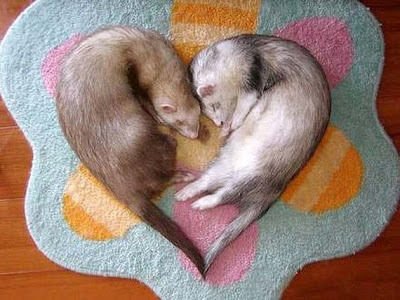 Cute animal reading break time! (I thought this was appropriate). Also, do any of you feel like you can identify with what I discuss above? Chapter 4 covered the methodology. Basically, I used both quantitative (survey) and qualitative methods (interviews) to gather data, and I conducted interviews with 22 students, and distributed questionnaires to 193 AUB students (I can expand this to you personally if you would like, but I don't want to bore you with more technical stuff). NOW, the part you've all been waiting so long for! The results included a personal, highly subjective nature to the individual’s definitions and perceptions of love, and that love is important to life and the participants ascribed a high value to love. The majority also considers being in love with someone a requirement for a successful relationship, and they rank being in love as an important factor in choosing a romantic partner. They also indicated that objectifying the concepts of both romance and love is problematic. These definitions are intrinsically connected to their experiences with romantic love and relationships, and each of the interviewees inherently associated love with marriage. The interviewees also frequently connected love to Western cultural conceptions, such as individualism, that they indicated clash with or challenge other cultural conceptions such as honor, shame, familial collectivity, and traditionalism. It was also indicated that love is a luxury, linked to social class, yet also saturated with contradictions by society and the family by, for instance, being emphasized and portrayed but not expected or practiced in reality. Additionally, the participants indicated they want more freedom and autonomy when choosing a romantic partner, particularly from their family, but most do desire parental approval. They also often disagreed with their parents regarding what they consider to be important in a potential romantic partner. Related to this, when considering their future children, many of the interviewees responded that they will not teach their children directly about love, but will show them what romantic love is through setting an example with their spouse, by teaching them about familial love, or simply letting them experience it themselves. Moreover, they also would actively pursue a relationship with someone from outside of their religious sect. Also, culture, family, peers, experiences, and the mass media were all indicated as having a particular influence on the way they perceive love, reinforcing the notion that love is culturally defined and socially governed. Lastly, evidence was given to reinforce the existence of a generational gap and the declining influence of the extended family. -- All 22 of the interviewees mentioned marriage, connected love with marriage, or mentioned love within the context of marriage even without being prompted to do so. -- The characteristics of "someone who is fun to be with," "someone who is intelligent," and "being in love" were collectively ranked as the highest qualities that the questionnaire participants sought in a potential romantic partner, and "similar political ideas," "someone who is rich," and "extended family approval" ranked the lowest. Also, there were no notable differences between genders, nor where there any notable differences between relationship statuses and between individuals who had reported that they had experienced love, those that had not, and those who did not know. -- The majority of both the interviewees and the survey participants reported extensive experience with romantic relationships, and their familiarity with love often originates from these relationships. Furthermore, they often informed peers and family members--such as parents, siblings, and cousins--that they were dating or in a relationship. However, the female interviewees were explicit about not informing brothers and fathers, while they do inform their mothers, sisters, and peers. Moreover, although their experience with dating as a whole was varied, many of the interviewees indicated that the rules of dating were unclear, though certain rules were universally known such as not displaying excessive public affection. -- Related to the post about the Five Love Languages, the interviewees were explicit about how they identify and express love. They often identified it through strong emotional feelings, wanting to sacrifice for another person, and attachment. The majority of survey participants also reported that strong emotional feelings were indicative of identifying love. The interviewees communicated that they express romantic love through physical touch and affection, verbal and written affirmation, and through action, service, and gifting. However, the majority of the survey participants reported that they express love through meaningful quality time spent with a romantic partner. -- Almost all of the interviewees adamantly agreed that they would date someone from outside of their religious sect, and the majority of the survey respondents (134, 70%) also agreed or strongly agreed they would still pursue a relationship with someone outside of their sect if they were in love with that person, with 32 (17%) either disagreeing or strongly disagreeing, and 27 (14%) chose neutral. 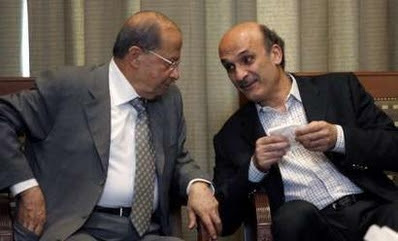 Geagea: "Oh no! It looks like the youth don't want to date within their sects as much! How do we keep them under control!?" Aoun: "Aye carumba! Don't tell Nabih!" I conclude my study by situating the results within the existing literature, proposing prospects for future research, and reiterating the limitations, for instance, that the results are neither representative nor generalizable to Lebanese or Arab youth as a whole, and that AUB students are not representative of Beirut or Lebanon, much less the entire Arab world. 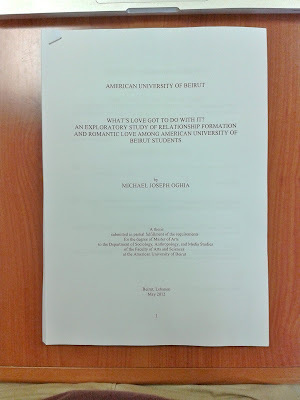 I close my thesis by quoting the song Fasateen by the Lebanese folk-alternative rock band Mashrou' Leila, which illustrates a common narrative among Lebanese young adults who are caught in-between familial, social, and cultural pressures and personal choice. So, in the future, if anyone wants to know what does love got to do with it, the answer for now can be that, indeed, it has much to do with it. I just want to say thank you so much to each of you who helped, supported, strengthened, and encouraged me throughout these one and a half years (crazy, right?). I cannot express to you the appreciation and heart-felt gratitude I feel, especially to my friends and family. I really could not have done this without all of your relentless support. I'm looking forward to your comments and questions! And of course, if you want to read my whole thesis, check it out here. P.S. Just to let you know, LOVEanon has almost 11,000 page views and more than 200 likes on the LOVEanon Facebook Page! Exciting!